I'm currently playing around with Wwise and UE4 using blueprints and wanted to do a footstep system that switches depending on the surface type. (I've managed to do this using UE4 own audio engine) I'm kind of struggling figuring out how to do this using wwise as a plugin. The problem that I'm having is that I don't know how to reference my footstep event to connect to my set switch node in my animation blueprint of my character. Does anyone know how to do this? Or point me to some kind of documentation of how to do this. Which is the tutorial I assume you followed. Anyways the trick is, is don't do it by switch. Just do it by AK event, you're basically manually creating the switch in UE4. So all you have to do is create an event for each set of foot steps. Hope this helps! GL! Thank you so much! Your solution worked like a charm! Yep I was using that one :) At first I tried using box triggers, but it proved to be tedious task of placing them in the world - and once you have a complex terrain the entire level was filled with triggers. Hope someone can help me out. Cheers! Hey Tri N; are the events in the animation anim bps? or AK anim notify? 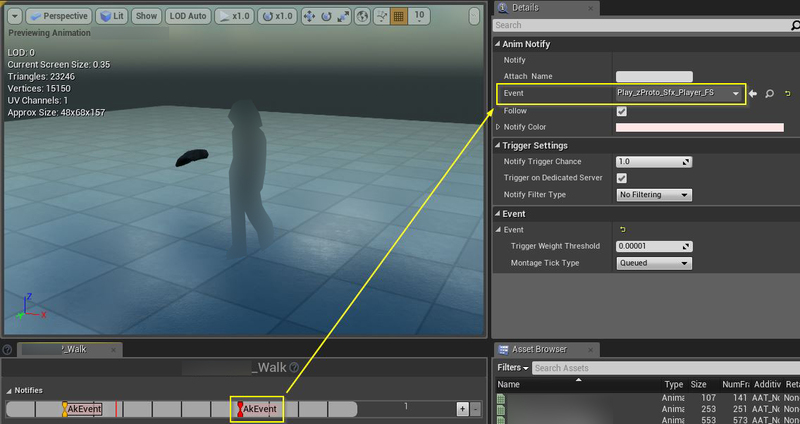 The event anim notify is placed on the character's run animations and the blueprint is place in the animation blueprint for the hero. Right now I have the footstep coming through but only the default surface. I'm suspecting it has something to do with how the surface material's collision is set up in unreal 4. Hope there's a way to solve this. I've been beating my head the past couple days trying to find a solution. I'm having the same issue! seems to only play the default sounds, although randomly it will play one of the physical materials set up and then get stuck on that material. Has anyone found a solution? I tried your solution, unfortunately I'm not able to make it work. And is that blurred out node a "Get Player Character" - I'm not really sure how you are able to reference your actor in the set switch node. Oh cool, I didn't think of doing it like that. The BP is a Blueprint class which is added to your pawn as a component. The blurred out box is your "Get Player Character"